Wentworth elm at the Palace of Holyroodhouse. Following extensive media coverage of the discovery of the Wentworth elm at the Palace of Holyroodhouse this blog seems like the appropriate place to give a bit more background on the story and to recognise the many contributions that have helped the story to develop. The discovery happened as a result of existing connections between RBGE and the Palace established by Laura Gallagher in the RBGE Nursery. Laura was exploring the propagation of the many fine elms in the grounds. As Laura was not familiar enough with elms to be able to do the identification she asked me if I would be willing to have a look. An appointment with the Head Gardener was arranged and I was shown all of the elms in the grounds. There are many fine specimen trees at the Palace and it was a real pleasure to get a guided tour from Stephen Christoforou who clearly knows and loves his trees. Among the many familiar elms were two tall majestic trees that have a distinctive weeping habit. As soon as I saw them I knew they would turn out to be interesting as they were completely unfamiliar to me, despite over 20 years looking at elms. During our survey I was able to tell Stephen that the two trees in question were identical to each other and represented a distinct clone that almost certainly had a cultivar name. I could see that they were of hybrid origin produced from a cross between the native Scottish wych elm (Ulmus glabra) and the southern European field elm (Ulmus minor). This hybrid has actually happened countless times and each of the hybrid offspring has its own unique characteristics. The scientific name applied to these rather varied hybrids is Ulmus x hollandica and they are sometimes given the common name Dutch elm (although that is a potential source of confusion and another story altogether). The next step was to establish the full identity of the tree by linking them to descriptions and images of a named cultivar. Not as easy as it might sound. 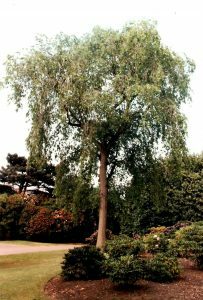 Gardeners and plant nurseries have selected and named trees, and other plants, over the years for particular distinctive characteristics. The Wentworth elm is an example of this process. Such plants are called cultivars and this word is derived from cultivated variety. As such Wentworth elm is not a species and it very much reflects what people have found to be attractive in elms. In order to get suggestions for the identity of these trees I passed on images to a network of contacts familiar with elms. Peter Bourne was first to come back with Wentworth elm as a likely identification. The key characteristics of this elm are a distinctly weeping habit and large glossy more or less hairless leaves. Further research convinced me that Peter was right and we began talking to the Royal Household about press publicity as the elms seemed likely to be the sole survivors of their type. Leaf of a Wentworth elm grown at the Royal Botanic Gardens Kew that matches perfectly to the Palace trees. The published record of Wentworth elms is very scant indeed. We don’t know the exact derivation of the name or where the elm originated. A famous Berlin nursery called Späth is known to have supplied this elm in the late 1800’s when it first appears in the literature. As Wentworth elm is not in the standard tree books of the time we can only assume it was never widely planted or known about. The proper full name for Wentworth elm is Ulmus ‘Wentworthii Pendula’ as cultivar names are always placed in single inverted commas and not in italic text. Thanks to Rob Cubey exploring the RBGE plant record archives we have unearthed a tantalising possibility. We have a record of three Wentworth elms arriving from Späth in Berlin in 1902. We also now know, thanks to all the media coverage of the story on October 4th 2016, that the Palace actually had three Wentworth elms. It has turned out that in 2008 one of the three was felled due to disease. Joe Muir, Park Manager at the time, had the rings counted and this indicated the tree went back to around 1905. Given that exact ring counting is tricky this result is in near perfect agreement with the RBGE records. Although we are yet to find the written proof, we can say with some confidence that the three RBGE Wentworth elms probably made their way to the Palace and were planted sometime after 1902. This would be consistent with accounts of other plants going from RBGE to the Palace at that time. In fact the Head Gardener at the time, William Smith, had trained at RBGE so it is very likely that regular contact between the two gardens was quite normal. Leonie Paterson at RBGE and Sally Goodsir at the Royal Collection Trust have scoured the archives to locate a record of the elms planting. So far, however, this final piece of the story has eluded us. RBGE Wentworth elm that died in 1996 due to Dutch elm disease. 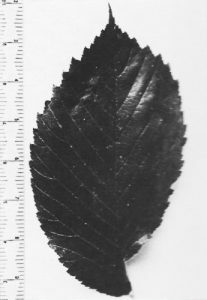 The RBGE did have a specimen of Wentworth elm until 1996 when it died from Dutch elm disease. This tree was considerably smaller than the Palace trio and must have been planted many years later. Even the former nursery site in Berlin, which is now an arboretum, has confirmed that they do not have a specimen of Wentworth elm. Given the wide geographical spread of Dutch elm disease in Europe it seems unlikely that Wentworth elms have survived elsewhere. The reason for the unexpected survival at the Palace is that the City of Edinburgh Council has controlled Dutch elm disease very effectively. Without this action by the Local Authority the Palace and the rest of the City would have lost almost all the many thousands of elms present today. Looking to the future and thinking about how we can ensure future generations are able to enjoy this majestic elm the RBGE will embark on a programme of elm propagation. Elms often root readily from cuttings, but if that fails a standard horticultural practice called grafting can be employed. 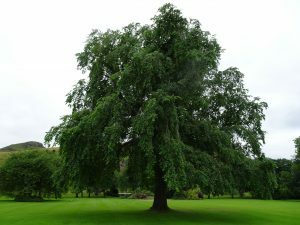 Given the disease control measures now in place in Edinburgh it would be safe to plant Wentworth elms and it is hoped that a new generation of trees might be established at the Palace and RBGE. Elsewhere in the UK there are other areas where the disease is strictly controlled or absent. Brighton hosts the National Collection and northern Scotland is still free of disease. Here populations of the very hardy native wych elm still thrive, representing a very unusual survival in a European context. New research is suggesting that certain parts of northern and western Britain are too cold for the beetle that is essential for spreading the fungus that causes the disease. In a few places on the higher mountains of Europe similar survivors have been noticed. Overall, the loss of elms has been massive (25-75 million trees in the UK alone). However, there is hope for the future. A small percentage of trees seem to have some sort of natural advantage and various projects are working to propagate this natural variation. The RBGE has worked on this in the past in relation to Scottish wych elm. In addition, since the 1970’s breeding programmes in various countries have been crossing and selecting elms for resistance with some considerable success. This has mostly involved crossing Asian elms with European elms as the Asian species display high levels of resistance. Research is showing that Asian species can get infected and yet display no symptoms of disease. In truth the future of elms looks bright and we should follow the lead of the Dutch who regard their national tree as something worth fighting for. Today if you visit Amsterdam most of the street trees are disease resistant elms. This is exciting and wonderful. Are there any of these trees in the USA? I’m an amateur tree-lover who grows gingkos. Glad you have enjoyed this story. It is possible the USA has some, but they do seem to have always been rare.